In case you missed them…here are part 1 & part 2 of my writing journey with God. Ahhh, feels wonderful to have shared all my “secrets” here on the blog. To let you know that I haven’t “felt like myself”. To reveal the amazing work God has placed in my path. To be honest about how I struggled to complete His work when I made it about my efforts. The next part of the story is so so…God. Phil Vischer said in his Allume keynote that he no longer believed the cute phrase, “God can’t used a parked car.” Through the bankruptcy of Big Idea productions and season of waiting, he learned how waiting on the Lord is the Biblical approach to following God’s will. It’s not about “the impact, but the relationship with God”. From mid-August until now, I was in a season of waiting on the Lord. Of getting back in the right relationship with Him. The summer I had forced the writing. My writing had no hope because I was hopeless and far from God-centered. But God was still pursuing me. He gave me bits of truth: a verse on a local church sign, a national news story, the perfect Psalm, a confirmation in a sermon. When each relevant tidbit came my way I scribbled on scraps of paper or in my notebook labeled, “publication” or created a voice memo on my iPhone. But I wasn’t writing chapters. In my mind I created a false “writing” rule. I believed if I didn’t have hours of uninterrupted time, then I couldn’t write. With our school schedule and no sitter, I have at least 2, 3 or 4 boys at home at any one time. To me, writing with the boys around was not an option. By the evening my brain was fried after answering a million questions, trying to get our discipline system back under control, changing a thousand diapers/pull-ups, making/cleaning up food, and keeping my home somewhat clean. Then one day my husband pushed me out the door on a Sunday afternoon. Sitting in Cafe Express with my random assortment of scribbles, I started a new Word document labeled, “brainstorming”. I sorted through my notes and typed them on the page. With each Scripture I typed, His message came back. A few weeks later, right before the Allume conference, I received an email from Bill (my agent). He simply asked if I would be attending Allume and wondered if we could set up a time to meet. I had bought my conference ticket a year ago. Long before I had been contacted by Bill. In God’s perfect timing our meeting would happen when I was on the “upswing”. A month or two prior, I would not have been ready. In my mind Allume would be like a women’s retreat. A time to breathe and my soul to be filled. God gave me “soul” time traveling that Thursday from 9am to 5pm. Once I arrived in Harrisburg He had another agenda. Did you know over and over God put women in my path who had just written books? I received encouraging messages like, “just get started”, “write thousands of words and then go back and edit”, “don’t allow your left brain to stifle the creativity”, “don’t be afraid to get help” , “It takes a long time to write”. Even Ann Voskamp, during her keynote, shared the story of getting harsh criticism from an editor. He told her, “Who do you think will read this?” and “Your words will never go very far in this world.” Boy was he wrong. Her words have been read by many (over a year on the New York Times Bestseller list, in fact) and her words have been translated into other languages. Another huge influence in getting me “back in the saddle” of writing, was Tricia Goyer. She presented, for the first time, a way to be a writer and a mom…successfully. Not ignoring my children. Not feeling them to be a hindrance to writing. But including them in the process. During family dinners, if she struggles to write a scene or character, they would all pray together. If she was asked to attend a book promotion, she asked instead of airfare for gas money & a larger hotel room so her family could go with her. Today I was home with three of the boys. Baby knox was taking a nap, Watts was in the playroom, and Price was painting pictures while I wrote this post. Suddenly I heard Watts say, “Mommy look what I made!”. I stood up from the table and looked down the hallway to see him proudly pointing out his Lego duplo train. 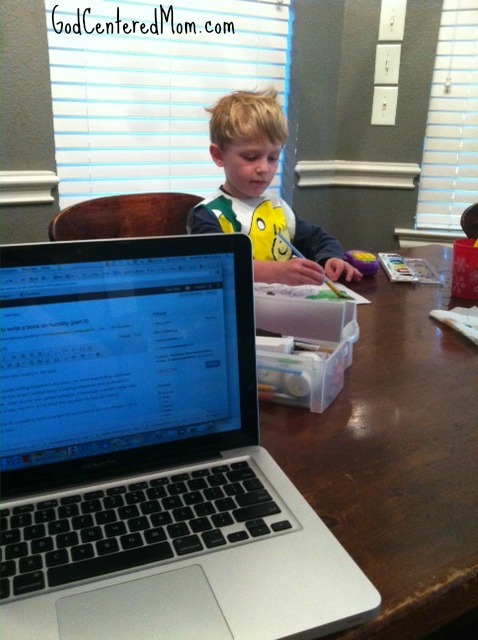 The other morning I had finished writing a chapter right as the boys came downstairs for breakfast. They came straight to my leather chair for early morning kisses and hugs. I said, “Guess what guys? Mommy just wrote the first chapter of a book! Let’s pray and thank God for helping me write the words.” They joined me in celebrating a milestone in this book writing. I want them to see God’s hand in this process. I also really want y’all to be a part of this writing process. You are my “chicas”! Just like when I greet a girlfriend on the phone, “hey chica!” I want you to know I value your thoughts and experience. Let’s do this!!! This is my first time reading your blog. I just started blogging myself and want to explore several larger writing projects, but, with little ones about, I feel as you did–I never have the time. How freeing it is to think of stolen moments and ideas and scribbles as getting us somewhere. You’ve really encouraged me today… now, off to wake the kids! So thankful! I’ve been waking up at 5 am to do my writing. Then an hour during “quiet time”. Yesterday was the first time I had pulled out the computer to write while kids are playing. I think it mattered more to them I was present and listening, than what I was actually doing. I’m more distracted checking twitter on my iPhone, than I was yesterday writing. Of course that isn’t the most ideal writing situation and will be my “rare” more than my normal moment. but it was good. Thankful you were encouraged. Praying for you Heather! I just read a children’s book to kids called “if I Never Endeavor” by Holly Meade. Thought of you and this process…so excited to walk along side of you cheering! thanks Jacki! I’ll have to check out that book. Grateful to have your support in this journey! I’m loving the behind-the-scenes look at your writing process!